Alrighty folks! Figured I'd start up a new thread about the adventures from KublaCon. First off, huge thanks to BEAR for three great sessions and adaptability with the system. Secondly, A massive thank you to those who were there. The creativity and positive attitudes from y'all were amazing to see and participate in. On top of great ideas and some truly out of the box utilization of the system at hand. For those who missed out, I'll give a short re-cap of the amazing and at times hilarious events that occurred in more detail once I've gotten some time to recoup from arguably some of the best three days of gaming I've had. And a huge thanks form me to everyone who came to play. The aftermath was well worth it! For those of you interested, here is a picture from our second group! Thanks Bear! You're awesome. We really appreciate all the effort you put into running the games at KublaCon. Cody got a lot of good feedback for us to pour through, so we'll keep you posted on any changes we make. Thanks man! You guys were great to play for. 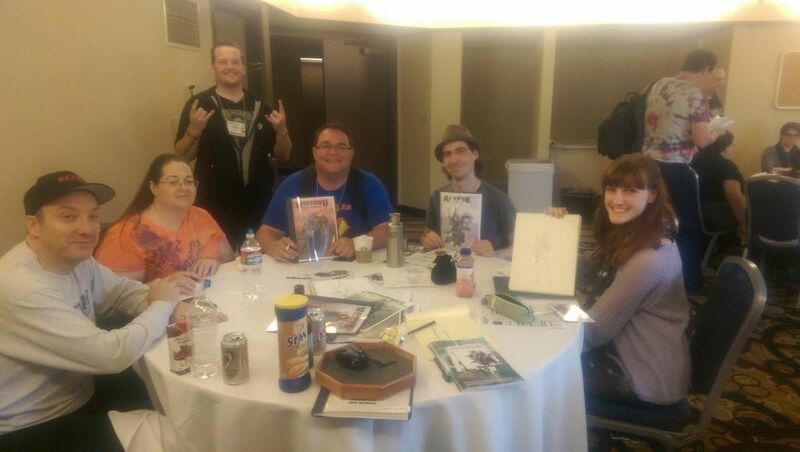 I will be doing this again at the next KublaCon for sure! I eagerly look forward to the results! You know how to get hold of me if you need any direct feedback too. Thanks again to Pul for coming with us to take said notes. It was invaluable to me as a GM to have a developer there to explain systems and to help write new ones when issues arose. Big hat off to that man, for sure. I was in the Sunday game at Kubla (I played the Alypse Illusionist). аI really liked the game setting (though, I'll agree with other threads that it's not really "steampunk"), and I think you have something special here with the mechanics around the Dice Code and the interaction between skills and stats. аI wasn't able to participate in the kickstart (I am generally pretty deaf to Kickstarter activity due to some horrible experiences I've had with them), but I am eager to dive in now. I also want to thank BEAR and Pul for putting the game on at Kubla. аBEAR, you are an amazing storyteller, and your view of the world really helped to make it jump off the page and come alive. аPul, I appreciate putting up with my endless ramblings, as I would happily talk systems and mechanics all day. аI hope that my feedback came off as constructive as I intended, and thank you both for helping to make for an awesome first exposure to The Shattered. You guys were an awesome group and I look forward to running many more at future KublaCons. So, takeaways from the sessions? аTo me, the damage reduction (DR) and crit mechanics are the two big things that need work. аSome thought was also floated around about illusion magic, but I'm not quite sure how much retooling that needs. I played in the 3rd session, with the "original" DR rules, and I've got to say, they were a little bit too powerful. аI as a player never felt threatened by any of the mobs simply because even when my DR was overcome, it wasn't by much. аHit/miss ratios seemed fine, and the damage amounts seemed reasonable, but either the HP pools were too vast at level 1 (20+2d10+toughness is a lot of HP for a "first level" character, and hp advancement appears slow compared to damage) or the DR was too severe to overcome. аSome ideas were tossed around about changing DR values, and just from an off-the-cuff estimate, I'd say cutting it in half (and maybe cutting the player HP down as well) would be sufficient. Another thing that needs some looking at was the critical mechanics, which were surprisingly effective given how hastily they were cobbled together. аCrit (basically) bypassed DR, dealing raw damage to the enemies. аIt's a solid choice, especially given how strong the player DR was (and how effectively we negotiated the damage onto our high DR tanks simply by having them take up 100% of the available space constantly), but not having enemies able to crit players imbalanced the system towards the PCs yet again (who, as far as I could tell, had vastly superior survivability compared to the mobsаanyways). аWhile I appreciate that the effort is to avoid player characters getting "one-shot" by a huge burst of damage, the current damage system did little more than tickle us. аGiving crits to the enemies would at least be a step towards making the game have a more lethal feel. аAlso, there were an awful lot of crits. One of the other points that was brought up at the end (and somewhat during) the playtest were the illusion magic mechanics. аIn short, the wording needed to be reworked a bit and the player felt somewhat marginalized because he couldn't deal combat damage (and felt that there weren't enough combat actions he could take to be effective). аI would heavily disagree with his assessment of the effectiveness of the class. аFirst, not every PC needs to be focused on blasting and smashing. аIllusion magic as it stands gives a lot of options for out-of-combat effectiveness, generic utility, and overall role-playing opportunities. аThis would be more evident in a longer campaign where there are more social settings and the sessions are less focused on testing out alpha mechanics. аSecond, and this is the biggest point, I think that the player just wasn't being creative enough. аOur Theurge had some quite inventive uses of magic in the previous session and some solid concepts in this one as well (huge fire cloud with the gas from a flamethrower). аMagic in this system is very flexible, which I think is awesome. аIt also makes it very, VERY powerful. аAt some point I'll write up an extensive analysis of how I see the magic in Shattered and how I believe it can be broken (and possibly fixed). Lastly, I'm about half way through reading the alpha rules and have some clarification questions that I'll put together in a post at some point. malloc said аI would heavily disagree with his assessment of the effectiveness of the class. аFirst, not every PC needs to be focused on blasting and smashing. аIllusion magic as it stands gives a lot of options for out-of-combat effectiveness, generic utility, and overall role-playing opportunities. аThis would be more evident in a longer campaign where there are more social settings and the sessions are less focused on testing out alpha mechanics. аSecond, and this is the biggest point, I think that the player just wasn't being creative enough. I agree that illusion magic canаbe used very effectively. аIn fact I recall at least one instance early in the session where it was VERY effective against the mobs. аWhen the illusion was cast on top of the Wretched to Intimidate the mooks into complete paralysis. аWhile this doesn't actually kill them, short of fright induced aneurysm, it did totally eliminate them as a potential threat to the party. I also had some thoughts toward the end of the session along the line of a sniper type character using illusion to completely hide themselves from the enemy. There is definitly discussion around this. We want the game to be far more deadly than was in the playtest. Reducing DR has been done, however we're still tweaking it some as a health adjustment is also being worked. Lowering the static health value, and having it play more off of TG is a potential alternative that allows for more scaling, and more lethality for sure. Another thing that needs some looking at was the critical mechanics, which were surprisingly effective given how hastily they were cobbled together. аGiving crits to the enemies would at least be a step towards making the game have a more lethal feel. аAlso, there were an awful lot of crits. Now I know that probably sounds off, focusing on Crafting when trying to finalize Crits... I know, but as I mentioned above, crits actually result in a considerable about of math crunching. And I'm the lead cruncher. Mostly just because I write java programs to roll 400 million combinations of ratings vs ratings, and giving me a success / crit success rates. As such I can let you know the general crit %'s for ratings. Obviously when you have a higher rating (or a bonus) the %'s will change. Now, likening the decreasing crit chance as you(and your opponeant) get more profecient, it's much less luck and far more training on both parties. As a result it makes sense (For us at least) that you know what you're doing and thus less likely to completely whiff on something you've been training for. Regarding Illusion, as I said Sunday I shall say here, I am sorry. Sadly, unlike a Crit push, this will take a bit more work than one guy running numbers, and will be included in our next Playtest Update. I know I can speak for the entire team on this, we absolutely look forward to hearing what and where we need to clarify things. We sometimes get so familiar with discussion about how a system works, we just miss ensuring that it's understandable to everyone else. Illusions being the glaring example. Again thanks for the insights!